The strong winds damaged the roof allowing a copious amount of rainwater to damage the attic, walls (note the blistering paint) and ceilings of this Airway Heights house. Our SERVPRO technicians promptly upon arrival, placed a tarp over the hole in the roof to prevent further damage from occurring. We could now begin the cleanup and drying out services for our customer. The leak from the bathroom doused part of the carpeting in this downstairs mother-in-law unit. It was vacant, but the carpeting in this West Spokane home was partially destroyed and required removal. We fixed the leak and removed the moldy flooring until a permanent solution was to be made. Plastic smoldered for hours in this house while the home owner was gone. A thick, oily smoke clung to every surface of this home. The home owner was at work during the fire and was very thankful for the neighbors who tracked him down. The home owner in this project was overwhelmed seeing his basement more than foot deep in water. 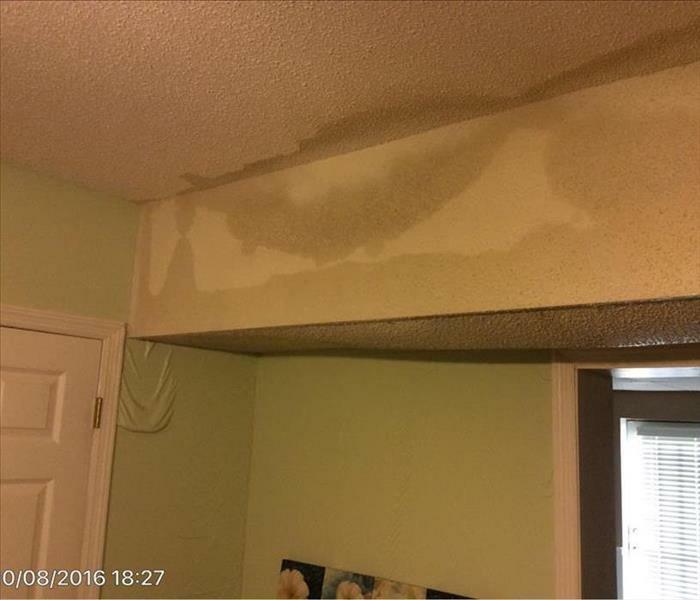 SERVPRO extracted the water and assisted the home owner in going through his damaged items to compile an inventory list. We were called to an apartment where the landlord suspected mold was behind the cabinets due to a dishwasher leak. After inspection we verified that there was residual moisture behind the cabinets and we removed them. 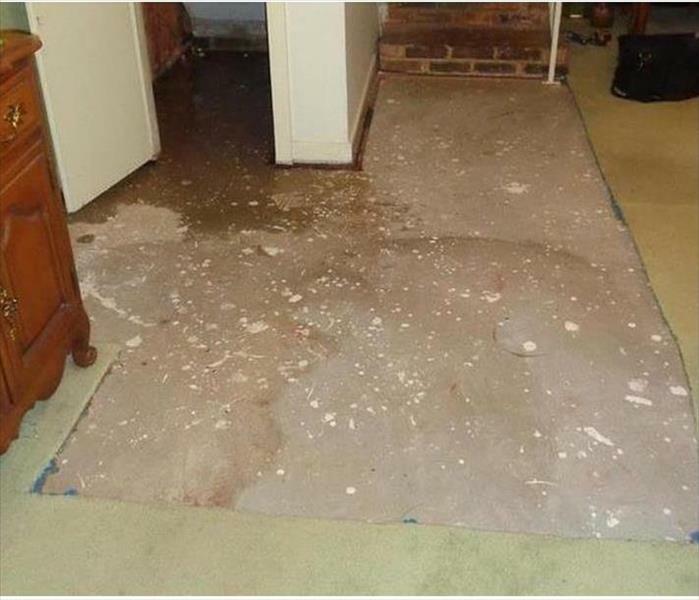 There was an extensive amount of mold present and we were able to remediate it quickly. No job is too big. When this local bowling alley had multiple pipes break, we were able to get them cleaned up and ready for league bowling that same night. 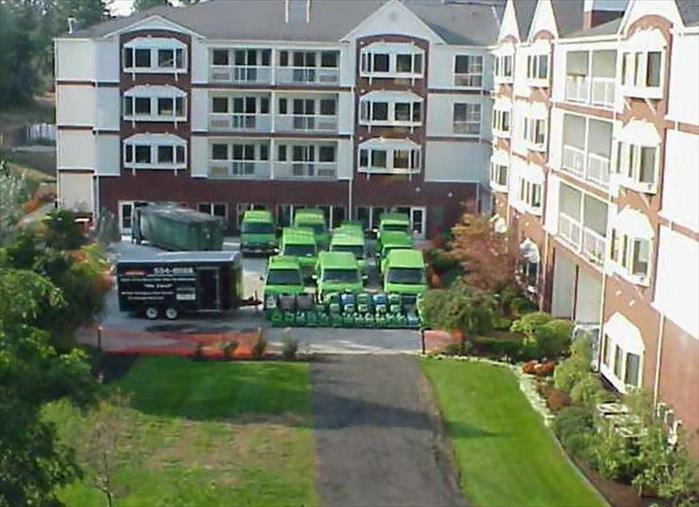 SERVPRO franchises have the ability to get a large amount of resources on site quickly. With multiple franchises, all willing to help each other out, we can deliver the largest amount of local resources. Another example or SERVPRO's local resources. This Spokane grocery store had a fire on December 15th. 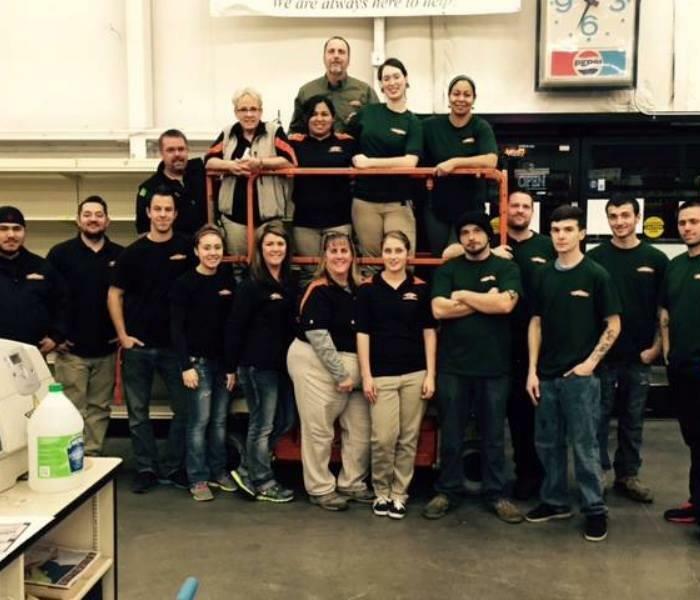 SERVPRO S&W and SERVPRO Spokane Valley had them back up and running in time for their customers to shop for their Christmas dinner. 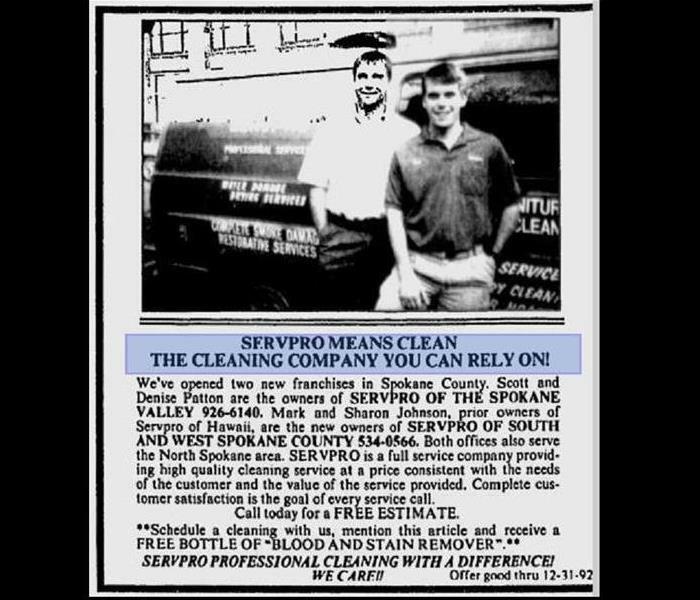 We happened to come across this newspaper article from when SERVPRO of South & West Spokane County and SERVPRO of the Spokane Valley opened back in Spring of 1992. Look at how young these boys were! When the "Great Windstorm of 2015" hit Spokane, residents of Spokane were caught off guard. Hundreds if not thousands of our customers were affected, from major damage like losing portions of their house to fallen trees to minor damage like living without power for a few days. It seems that every single home in our area was affected in some way. Our hard working crew responded around the clock to the never ending onslaught of claims that came to our phone. Kudos to all of the technicians who didn't stop to take a breath but tirelessly worked to get people back to some sort of normal.